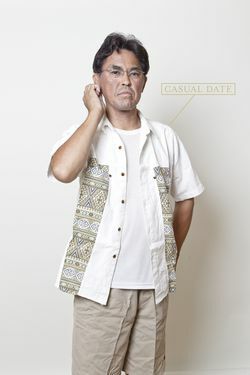 Ryuichi runs a small Japanese company, "I Want To Cheer You Up Ltd." – from his cell phone and laptop. Ryuichi and his employees are professional stand-ins, part of a growing service industry in Japan that rents out fake spouses, best men, relatives, friends, colleagues, boyfriends and girlfriends, all to spare their clients’ embarrassment at social functions such as weddings, funerals, or other family gatherings. He runs the company from his kitchen, and without his family's knowledge. Ryuichi launched his company after abandoning plans to become a counselor. Today he employs 32 stand-ins of various ages and both sexes across Japan, with the skills and personality required to temporarily but convincingly adopt new identities. Via cell phone and email, Ryuchi fields requests and makes appointments for himself and the other stand-ins. In his job, he can finally be the perfect husband and father he doesn't know how to be at home.